If you've had the chance to hang in a hammock on our lovely corner of Calles 24 & 19 in El Vedado while sipping on a magnificent cafe bonbon, you know Cuba Libro is much more than a bookstore and coffeehouse. For those who haven't yet stopped by to learn about our vision, mission, and programming, here are some media links to catch you up to speed. 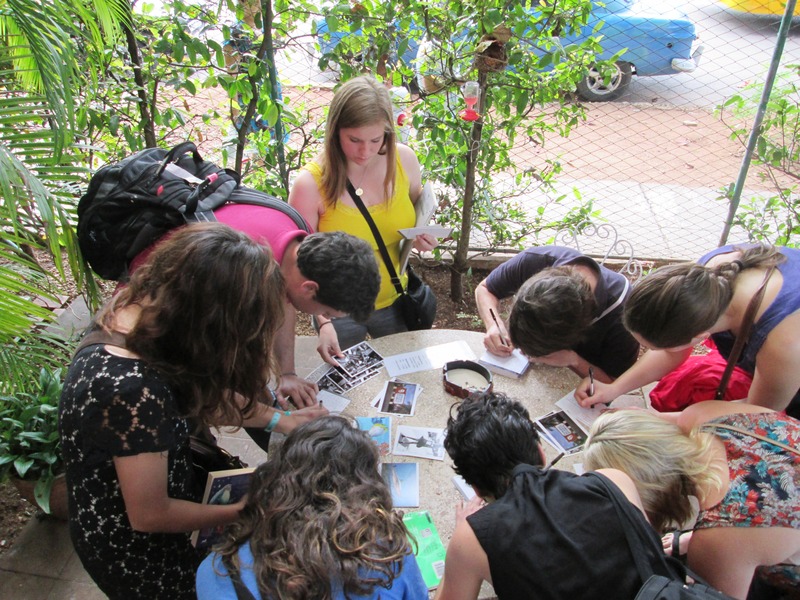 US university students jump on Cuba Libro's postcard service, 100% original images only available here! When Cuba Libro opened its doors in August 2013, AP was there. The Wall Street Journal, usually quite testy on Cuba, jumped on this story about the island's only English-language bookstore. The quality of our coffee is as good as (or surpasses!) the quality of our books. Read what The Kitchn thinks about our coffee culture. Experience has shown that it's easy to become addicted to Cuba Libro. Here's what happened when this writer happened upon us. Our first radio interview when we opened, with none other than PRI/The World. Woot! In 2015, Cuba Libro was approached by The Travel Channel to appear on their adventure/coffee show Uncommon Grounds. Luckily, we're in the first 15 minutes of this episode. It was a pleasure sitting down with Montana Public Radio host Brian Kahn to talk about Cuba Libro in March 2015. Cuban journalist Cristina Escobar dropped in to Cuba Libro to do a story for TeleSur. Radio is so much more user friendly (for the interviewee!) than TV. Here's a piece from 2017 including Cuba Libro on BBC Radio. OnCuba Magazine vino para descubrir por que Cuba Libro? Por que ahora? Apoyo para Cuba Libro viene de todas partes. Aqui, Cuba Contemporanea escribe sobre la realidad de cuenta propismo hoy dia en La Habana. Haciendo television, a la cubana; esta vez para OnCuba. Todo el mundo quiere saber: quien es la yuma loca que fundo Cuba Libro? Aqui, Progreso Semanal revelo todo en 2016.